I created three scenarios to develop a range of likely global inventory levels and future oil prices. 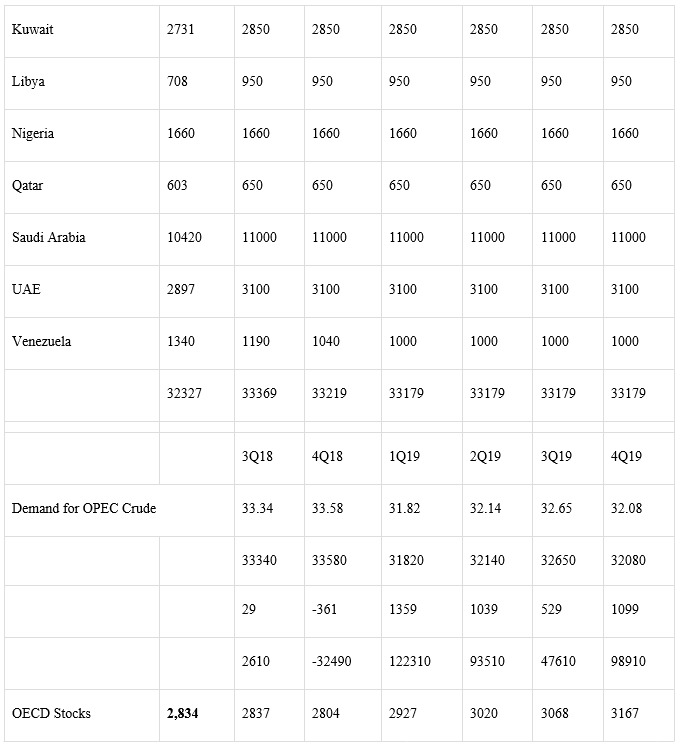 The base case “demand for OPEC crude” is from OPEC’s own July Monthly Oil Market Report. 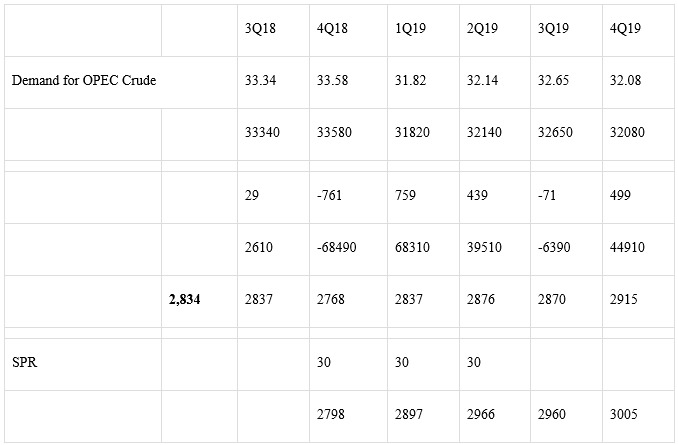 In all three scenarios, I assume production in Venezuela drops to one million barrels per day (mmbd) by 1Q19 and stabilizes there. 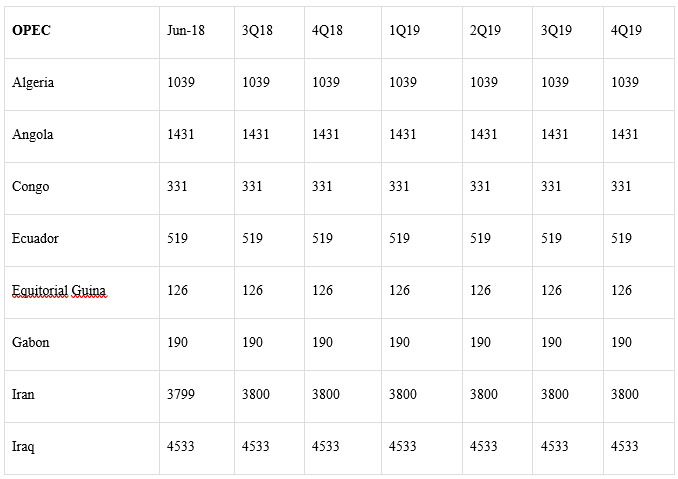 I also assume that Saudi production rises to 11 mmbd and remains at that level and production increases in the UAE and Kuwait. The most optimistic scenario for Iran is that the sanctions have no net impact. 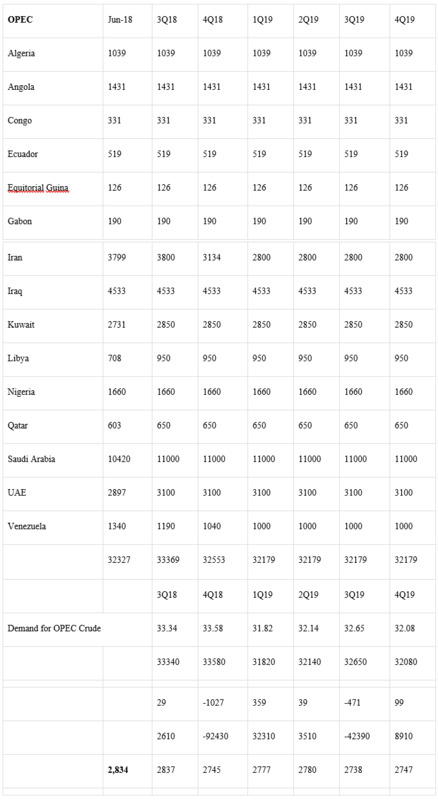 China and India increase their Iranian imports as a result of receiving heavily discounted prices. Under this scenario, global OECD stocks drop to 2.804 million barrels by year-end. This would support a WTI crude futures price of about $70/b, and so Trump may decide to release SPR barrels to get gasoline prices lower before the November elections. A release of 30 million barrels would result in a price of about $65/b. Note: these price projections are based on an inventory regression model of stocks and prices. A more likely scenario is that sanctions have the effect of reducing Iran’s production by about 600,000 b/d. 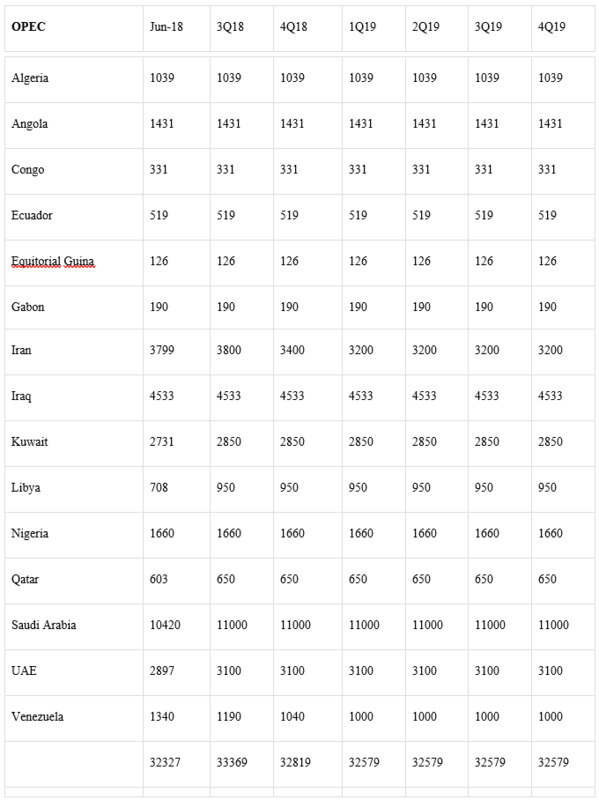 The table below shows an estimate of where exports may drop. Source of Iran's exports: Bloomberg. Under this scenario, OECD stocks would drop to 2.768 million, which would support a price of about $75/b, and so a drawdown of the SPR would almost certainly be ordered. Assuming a 30 million barrel release, the price would be around $70/b. Under a third scenario, I assumed Iran’s production would drop by one million barrels per day. That would bring OECD stocks down to 2.745 million, which would support a price of nearly $80/b. Trump would almost certainly order an SPR drawdown, and perhaps it would be larger than the 30 million barrel level. He might also grant more waivers to reduce the impact of the sanctions. The rise in production by KSA and friends is likely to be larger than any net loss by Iran and Venezuela until November. Iran may even schedule sales from its storage before November, producing a modest surge in its exports. As a result, global stocks may build slightly, reducing support for oil prices. Assuming the sanctions are imposed in November, the range of possible effects could keep prices at $65/b or lower, up to $80/b in a “worst case” scenario. But if such a scenario develops, it will likely be short-lived because the SPR would be drawn upon, probably in coordination with the IEA. HIGHER PRICE OF CRUDE WILL LEADS TOWARDS THOUGHT OF ELECTRIC CAR AND BUS SEGMENT ON NATURAL PATH . AT THE ADVENT OF FIRST CAR WAS RUN BY BATTERY OPERATED ALL THE CAR COMPANIES SHOULD CONTEMPLATE IN THIS DIRECTION IN ORDER TO REDUCE EACH COUNTRY"S CURRENT ACCOUNT DEFICIT.